With over a decade of proven success in business linkage and providing outstanding new business opportunities, SUBCON THAILAND is at the center of successful parts sourcing action. The 2017 event is again being organized by the Thailand Board of Investment in conjunction with UBM Asia (Thailand) and the Thai Subcontracting Promotion Association. 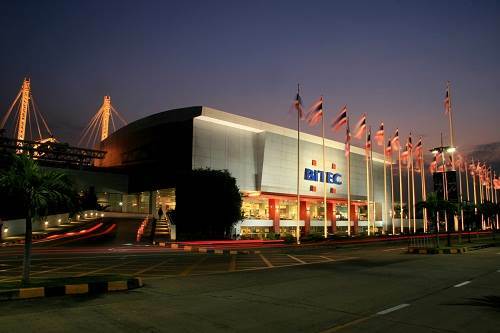 The show will be held in Bangkok, Thailand from 17-20 May 2017 at BITEC. 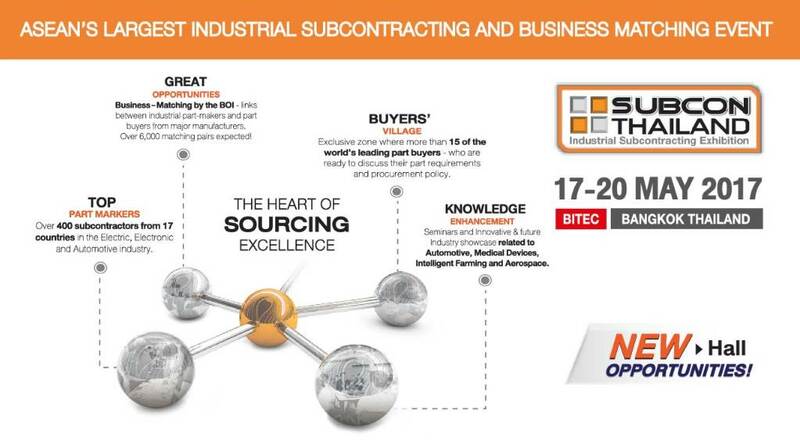 Thailand is proud to have become the regional hub for sourcing industrial parts, and the 2017 event will feature leading part-makers of metal, plastics and rubber parts; electrical and electronic components; moulds and dies; tooling, jigs and fixtures - plus a variety of support industries such as Automotive, Mechanical, Electronic, Electrical Appliances, Air-Conditioning and more. More than 400 industrial part-makers are expected to exhibit at this record-breaking event. Over 25,000 Industrial Part Buyers from all over the world, including large Tier 1 and Tier 2 corporations will also be attending the event which provides an excellent business platform for important new industries such as Medical Devices, and Aerospace Equipment. One of the highlights of SUBCON Thailand 2017 will be the match-making program which offers outstanding business opportunities and business linkage designed to help you establish long-term, global partnerships between part makers and part buyers from around the world. So if you’re looking for business opportunities, SUBCON Thailand 2017 is a must …and right at the heart of the action. You can’t afford to miss this unique opportunity for new business and and to discuss your products and capabilities with direct procurement officials from large corporations that normally would be difficult to contact.